Feeling fancy? Drop the raw sliced asparagus into ice water for a minute or two and it will curl into ribbons. In a hurry? Cut the asparagus into thin coins instead. In the dressing, the avocado provides its natural healthy fats for smooth and creamy results. Nobody will know it's a health-promoting, no-oil-added dressing! Feel free to add some organic walnuts, pumpkin seeds, almonds or other favorite organic nuts or seeds. Puree green onions, avocado, juice, salt and pepper in a blender or food processor until smooth to make a dressing. 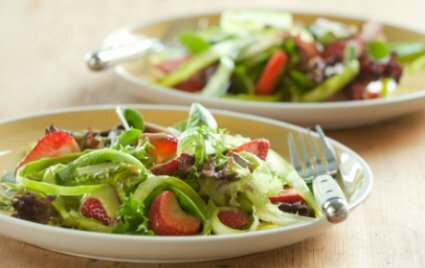 In a large bowl, toss greens, strawberries and asparagus together. Transfer to plates, drizzle with half the dressing and serve. Extra dressing will keep one day refrigerated.